Windows Live Writer Has Been Open Sourced! This is good news. Windows Live Writer, my blog editor of choice, is now open source! Rechristened Open Live Writer, it has moved to the .NET Foundation briskly as a 0.5 version… I want to imagine this is to prevent its death in a closet at Microsoft but you can read all the details at the release instead. It has been on life support for about 3 years and its still one of the very few Windows must installs for me. Some highlights include best offline post writing available and seamless integration with WordPress. It will be refreshing to see Live Writer Open Live Writer be further developed after so long. Neat. One of the few frustrating experiences learning VMware Hypervisor has been loosing my server! At install time, I must have defaulted to automatically getting an IP Address from DHCP. Twice now, I’ve attempted to login thru vSphere and my server is nowhere to be found. The hosted VMs are all accessible. Its just VMware that goes M.I.A leading me to the suspicion that I did something wrong. My usual fix is to scan my network for devices. After figuring out which IP Address is my server at now, I proceeded to the servers configuration page on the right and selected networking from the mid-left pane. 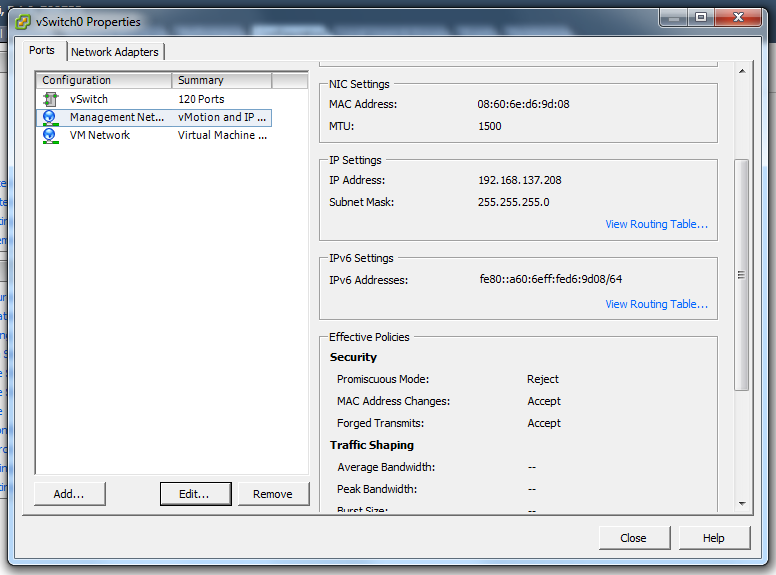 Selecting properties from the rightmost panel brings up the networking details for the server. Here, I can see my new IP Address as well. 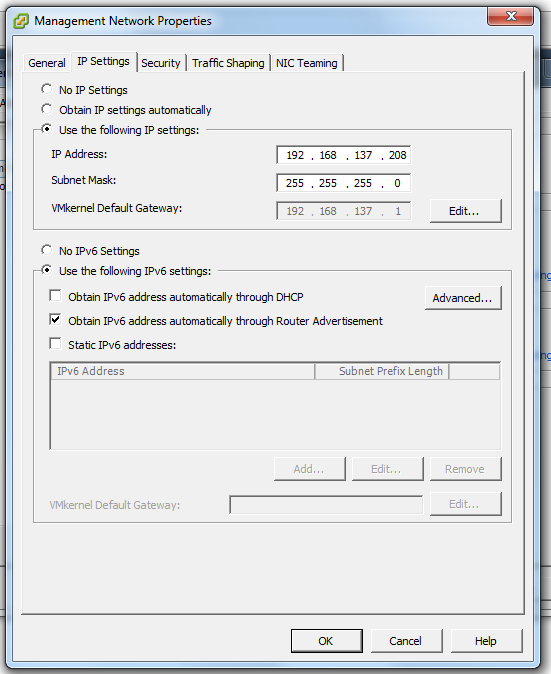 Selecting Management Network from the left pane and pressing the edit button brings up the network properties where I can change the IP Address. Easy enough, I changed my settings to statically set my IP Address. Done! 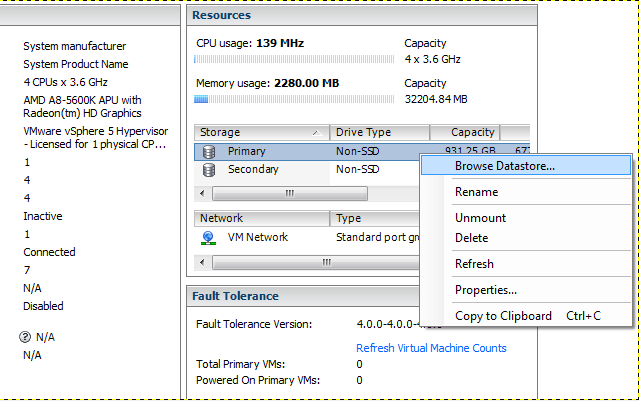 One missing feature of the wonderful free version of VMware vSphere Hypervisor is the auto-magic way of cloning a VM. Nothing I could find at least on this. There are features for managing snapshots of VMs, for taking snapshots and related tasks, however, to backup/clone a VM, you have to take matters into your own hands. Before you follow this steps, ensure the VM you’re about to clone is off. 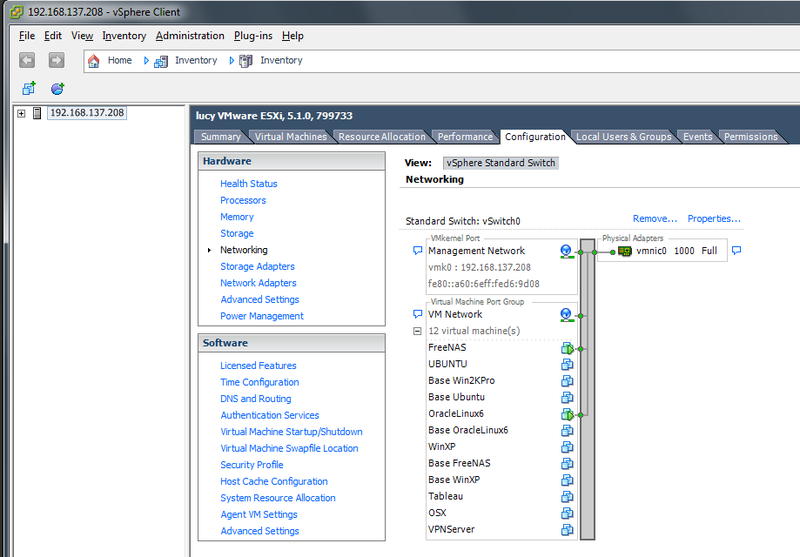 First step, on your VMWare GUI, from Storage section, right click/browse the datastore where your VM image is stored. 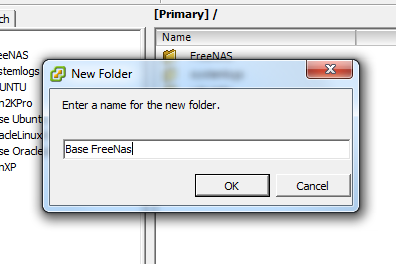 On the Datastore Browser, create a new folder. This directory will shortly become your cloned VM directory. 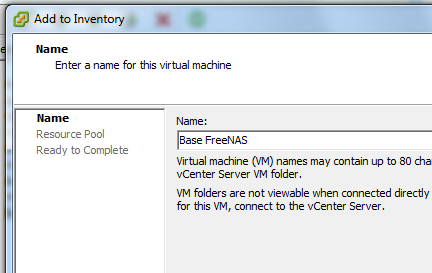 Having created a directory for the VM (to be cloned), click on the folder of the VM you want to clone now. From the contents of this directory, select all the files, skip the logs and right-click copy. Notice screen-grab shows .ldk and .vswp files. The existence of these is because I grabbed the image from a running VM. Remember the VM to be cloned should be shutdown. These files should not be part of copy/paste steps. 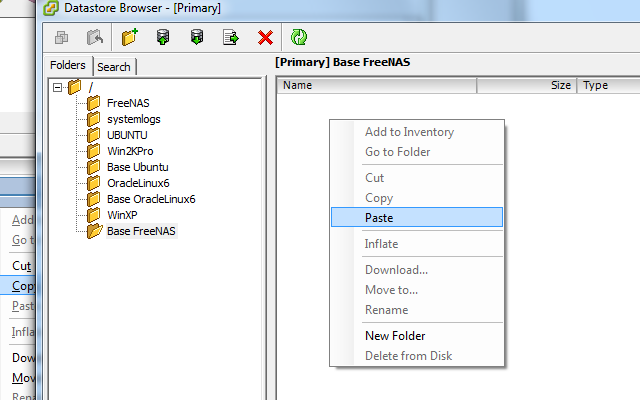 Having copied all the files, go back to the newly created directory and right-click paste these previously copied items. 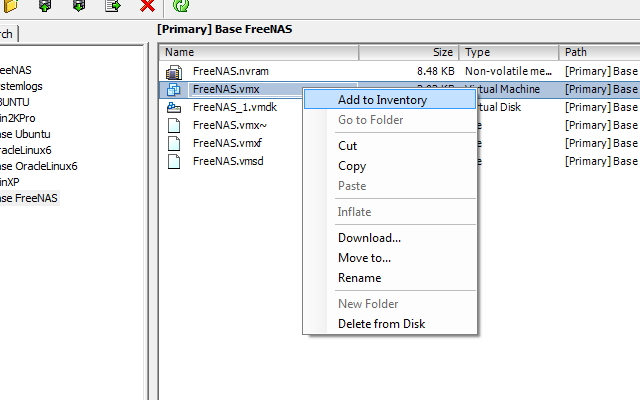 From all the copied files, right-click the file with the vmx extension and select ‘Add to Inventory’. 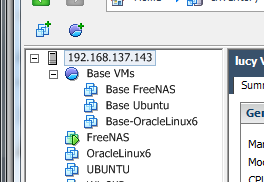 Finally, select the location of new VM. 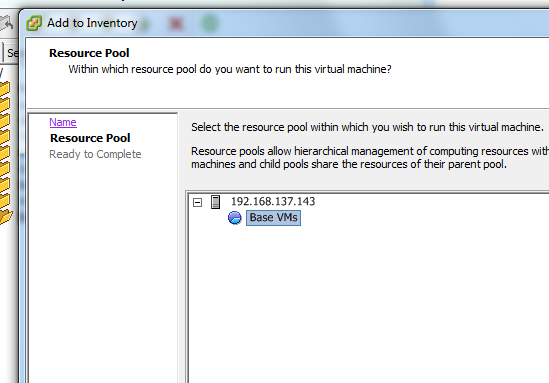 Here you can see me place all ‘Base’ VMs in their own ‘Resource Pool’. I am only doing this to group together copies I make of any VM I configure. I haven’t even looked up why I want to use a resource pool for its intended purpose. Last night’s meeting was a cozy but a good one. Will Gorman from Pentaho graciously presented on Pentaho’s OLAP Solution (Mondrian) and I presented on MicroStrategy’s equivalent (Intelligent Cubes). It seems to be a great time to be working in IT in good O-Town. If you want to find out about our next meetings, jpb opportunities and networking, check us out at our CFBI Page and become a member. You may be aggressively contacted by ‘Three Star/RightFitStaffing’. Stay away. Doing homework on leads I found this which points to this report in our own local news channel. I had both posted and made this post private because I wasn’t 100% certain. After doing some more homework, this seems to be not so uncommon nowadays. I foung lots more information at this blog. I have no use for the original ram (2.0 GB DDR3) that came in MacBook Pro and it is not worth putting up on Ebay.